Anti Wrinkle Facial Cream is a revolutionary moisturizing cream, based on an innovative collagen generating formula. The cream guarantees fast visible results ? it fills in wrinkles, immediately improving the skin?s texture and providing a sense of freshness. Use the cream daily and you will see its accumulative effect ? preventing new wrinkles ? your skin will be firm and smooth over time. The cream is based on an advanced, unique complex of active protein components ? peptides (amino acids). The protein components penetrate the skin and stimulate the natural collagen production mechanism (a protein that provides the skin?s volume). 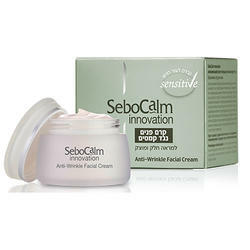 This way the cream invigorates your skin to repair itself and prevent new wrinkles from forming.